That’s how I felt back when I had to hook things up on or to my computer, but didn’t have the first clue as to what I was installing, what the specific piece of equipment did or why I needed it. I was just told by the sales clerk and my internet service provider that I had to have it to make my internet work. So I bought it and proceeded to tear my hair trying to figure out how to get it to work. I think a lot of people find themselves in a similar position when trying to get themselves hooked up to the internet. So I wanted to create a quick guide explaining what some of these components are and what they do. Not what you’re looking for? Shop all the highest rated modems at Amazon. What Is a Modem and What Does a Modem Do? A modem is the tiny box or device that sits between your computer and your wall or cable box, depending on the type of internet connection you have. 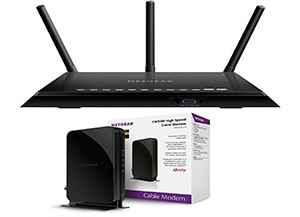 If you’re using dial-up or DSL then your modem will connect to the wall and if you’re using cable then it’ll hook up to your cable box or available coaxial cable. What your modem does is translate the data that is sent to it so that it can display on your computer. Computer information is stored digitally, however information sent over phone and cable lines are analog waves. So your modem takes the analog waves, changes it to digital and delivers it to your computer. In other words, your modem will connect you to the internet so that you can watch videos, upload videos, check emails, play on Facebook and anything else that you’d like to do online. What Are The Different Types or Kinds of Modems? There are a couple of different modems, and the one that will work for your situation depends on the internet connection that you have. 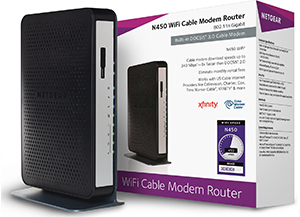 Cable – Cable modems use coaxial cables. One end connects to the back of the modem and the other end connects to your wall or to the back of your cable box. Cable internet is considered to be “high speed” internet. DSL – DSL can either connect to an external modem (like cable, but a different plug-in), or your computer will already have an internal modem that will dial-in through your phone line. Unlike dial-up, you can still access the internet while talking on the phone. Dial-Up – Dial-up is the oldest form of internet connection. It uses your phone line to connect to your ISP. Dial-up modems are much slower compared to cable and DSL. Also, if you only have one phone line you won’t be able to access the internet at the same you’re talking on the phone. 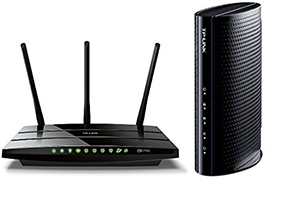 Other then choosing a modem based on the type of internet connection you (will) have, there are a few other variables or requirements that you should look for before purchasing. Compatibility – Is the modem compatible with your computer (Windows, Mac, Linux, etc)? Furthermore, is it compatible with your computer’s software (7, Vista, 10.4, etc)? Upload/download speeds – Next you’ll want to check the “upstream” and “downstream” speeds, as they’ll differ from model to model. Often times it’ll even be different from one direction (upload) to the next (download). Security – Does the modem support security features such as WPS (WiFi Protected Setup), WPA/WPA2 Security Protocol and WEP, TKIP and AES (64/128 bit) Encryption? Size & mounting options – How big/small is the modem? Will it fit well with your other computer equipment? Some modems can even be attached to the wall. Is this something you’d be interested in? Price – Modems will vary in price from as little as $10 to as much as $175+. The difference in price comes down to the type of connection, speeds and any features or “bells and whistles.” Most people could probably get away with spending $50-$75 on a modem and be perfectly happy (from my experience). I would also take the time to read online reviews at different retailers and review sites such as Amazon, CNET and Consumer Research. While the (positive/negative) reviews shouldn’t impact your decision 100%, you can go through them and see what the common praises and complaints are. Another option is to get your modem from your internet service provider. The upside is that it’ll be their equipment, so if you have any problems installing it they should be able to help you quickly. The downside (for me) is that you have to rent the equipment on a monthly basis for a few bucks a month. After a year of service (or two), you’ve already purchased a router two. Then if you cancel your service you have to give your modem, and any other equipment you’re renting, back to the ISP.